Like all Blurs, the Kershaw 1670NBSW is equipped with a big, slightly recurved blade that's ideal for multitasking. The blade shape offers both excellent slicing and piercing capabilities. High-performance Sandvik 14C28N stainless steel provides the Blur's blade with corrosion resistance and excellent edge-holding ability. Like all Blurs, the Kershaw 1670NBSW is equipped with a big, slightly recurved blade that&apos;s ideal for multitasking. The blade shape offers both excellent slicing and piercing capabilities. High-performance Sandvik 14C28N stainless steel provides the Blur&apos;s blade with corrosion resistance and excellent edge-holding ability. The stonewashed blade finish gives the surface a desirable roughened or scuffed look that helps hide scratches and fingerprints. The handle is built of durable 6061-T6 anodized aluminum, which is sometimes described as aircraft aluminum since it is a common material used for aircraft fittings. 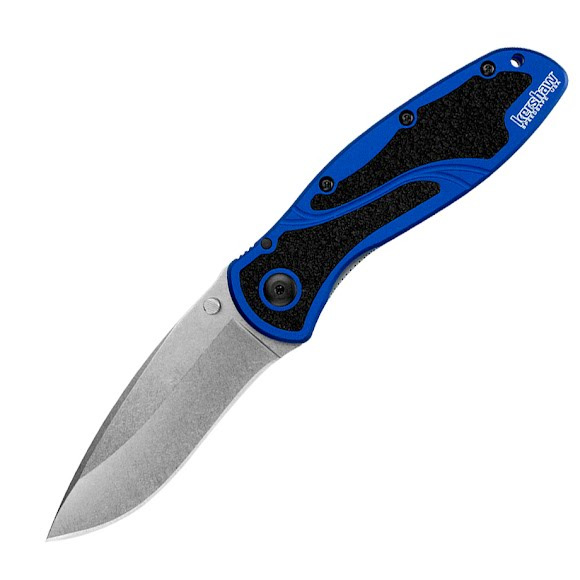 It&apos;s lightweight, extremely durable, and anodizes well so Kershaw can create colored handles that are scratch resistant and extra tough. Trac-Tec grip-tape inserts provide an extra-secure grip. The Blur&apos;s inset liner lock ensures secure blade lock up during use. For easy one-handed opening, the Blur is equipped with SpeedSafe assisted opening. Just push on the built-in thumbstud. The reversible pocketclip lets you carry tip-up or tip-down comfortably. Locks the blade open during use; one side of the knifeÕs steel Òliner,Ó the steel plate to which the handle scales are attached, moves into position behind the blade to securely lock it open.